ASK A CAT® EXPERT: COULD TODAY’S ENGINEERS BUILD A ROBOT AS COMPLEX AS OPTIMUS PRIME? The answer to this question is complex. Consider first that engineers and scientists have just scratched the surface of the potential of robots and artificial intelligence here on Earth. For example, in 2014, a joint venture (Brave Robotics, Asratec Corp. and original Transformer creator Tomy Co. Ltd.) launched their autobot, J-deite. The bipedal robot converts into a sports car, however, it is only three feet long and is too small for a driver. And, it is light years away from the capabilities of Optimus Prime. To get a better understanding of the complexities involved, we asked one of our engineers to explain just how big the engineering challenges would be when building a robot with the capabilities of Optimus Prime. We assured Brian that in the land of “what if” we spare no expense, then asked him what challenges he would tackle first. “In the vehicle state, Optimus Prime is an on-highway truck that weighs about 40 tons. The truck has an engine that runs on diesel fuel that turns the axles and drives the wheels – a reasonably efficient use of energy and mechanical horsepower. But doing what Optimus Prime does—walking, jumping, running—we would need an immense power source to provide that type of movement of that much weight. And, we don’t have an Allspark as an option. “In addition to mechanical horsepower (i.e. what powers a truck), there are three common ways to achieve the force required to move iron—pneumatic, electric or hydraulic. Hydraulic power makes the most sense here because it delivers the highest power-to-weight ratio. 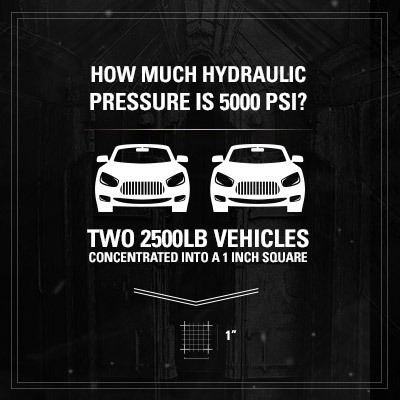 Caterpillar builds the largest line of hydraulic excavators in the world—and we are constantly optimizing hydraulic systems to provide more digging, lifting and “moving” power. “For comparison, if we take a Cat® 336 Excavator which also weighs nearly 40 tons, we can think of the boom, stick and bucket as moving parts like Optimus Prime’s legs and feet. By comparing the two, we can get a sense for how much hydraulic pressure might be needed to get movement from an Optimus Prime-sized robot leg. “Leg movement would likely require over 5000 pounds per square inch. How much pressure is that? Imagine two cars, each about 2500 pounds, one on top of the other, being concentrated into a one inch by one inch square. So a real robot with the capabilities of Optimus Prime will have to wait for the engineering and ingenuity of the future. In the meantime, we can experience the amazing abilities of Optimus Prime in the movies.